Do you know who grew that? Here at A&L, we do everything we can to buy as much locally grown and raised product as possible. When we have to go outside our home area, we do everything we can to source from small purveyors that are making only the best products. Near or far, rest assured that all of our purveyors have the same high standards as we do for the things they produce and sell. As we meet and begin working with new farms, purveyors, vintners, etc., we will post about them here! Check back often to see who's new, or meet the people that made last night's dinner! Meet Gabe and Molly Clark and their beautiful Girls! On their Ranch in New Portland, ME, Gabe and Molly raise 100% grass fed beef that is GMO-free and certified to meet Global Animal Partnership animal welfare standards. They also raise a cross of heritage breed pigs for pastured pork. All of their animals are born, raised, and butchered in Maine. They sustainably manage over 600 acres of pastures, hayfields and woodlands in the mountains of Western Maine with the belief that healthy fields and forests provide abundant habitat for wildlife and the finest tasting meat. They offer beef and pork year round; processing animals weekly so that fresh product is always available. They hope you enjoy their meat as much as they enjoy raising it. You can read more about their operation here. Meet Jean and Peter Koons! They handcraft small batch artisan cheese and yoghurt from their Alpine and Saanen goats and organic Jersery cows' milk from nearby Woodside farm. Their goats are raised on pasture and GMO free grain and their cheesery is solar-powered. They make a wide variety of fresh and aged cheeses that reflect their family roots, bringing pastoral skills and recipes from New Zealand to Maine at their family farm in Sidney. You can learn more about Kennebec Cheesery here. Today, most commercial farmers raise pigs inside barns where they are fed grain and given antibiotics and hormones or drugs to speed growth. The pigs on White’s farm are raised outdoors. They roam and root on 120 acres of farm land without drugs, hormones or antibiotics. Their natural pork is much better tasting and better for your health. They make 5 different types of all natural, nitrate free salami by hand, themselves, with family recipes.The spices are 100% organic. If you are looking for local, New England authentic salami, this is it. Learn more about White’s Farm here. Best known for her unique Basket Ricotta, Allison Lakin produces some excellent single-farm cow’s milk cheese! In her space on East Forty Farm in Waldoboro, Allison takes such great care with each variety of her products that it’s hard to believe she’s only been doing this 7 years! Learn more about her cheese here! 3 level farm is a 145 acre, diversified organic farm in China, Maine producing fresh veggies, fruits, culinary herbs, eggs, goats and cheese! Learn more about them on their Facebook page! Located in New Sharon, ME, Pine tree poultry raises all of our chicken products and Cornish hens. All of their animals are raised free-range, using sustainable practices, no antibiotics or hormones, and an all-vegetarian diet. You can learn more about Pine Tree Poultry here. 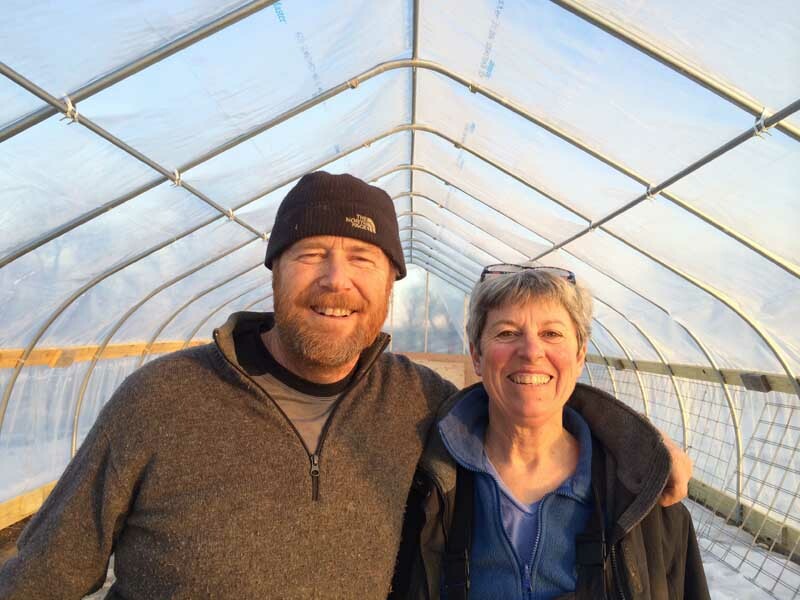 Winter Hill Farm is a leader among Maine farms. While they will try to convince you that all they are is a small family run farm, they truly are much more. They are leaders in their community; committed to stewardship of their animals and the land, transparency and honesty about the food they produce, and the concept that community is the foundation of good food systems. The quality of their product speaks for itself, but take a look through their website for more information about their farm and their practices. We think you’ll be as impressed as we are. Debbie Hahn makes what is probably the best blue cheese I’ve ever had, right here in Maine (Phippsburg, to be exact). “…I ask to see the cheese cave, and Debbie obliges, leading the way downstairs to a room with a concrete floor and one below-ground wall cut into the rock and ledge that she says helps keep the room naturally cool and the humidity at about 95 percent. Neatly arranged on racks, the 400 or so rounds weigh in at about ten pounds each and look like flour-dusted loaves of bread. …I’m in luck, .... She cuts into a gorgeous, tall wedge of her Bleu Velvet that’s veined with inky streaks and tastes tangy and sharp, and is as rich as butter.